There are no mysteries about poverty, neither its causes nor its cures – which are more jobs, more money, more education and more Sure Start. What works has been studied by researchers for a hundred years. We know it all, and yet we grow closer in inequality to America and further from the rest of Europe. The government’s astonishing trajectory of cuts means that, according to Professors Peter Taylor-Gooby and Gerry Stoker, by 2013 public spending will be a lower proportion of GDP in Britain than in the US. Leeds Social Media Surgery is a free advice session for community and voluntary groups, clubs, societies and small arts organisations. Come along to find out how you can use free web sites and services to organise activities, promote events, raise funds, collect feedback from your participants and more. There are some great testimonials from people who have come along before on the link below. So if you’re not sure what we can offer please have a look/listen. Presentation guru Garr Reynolds shows us what we can learn from Bamboo. Be like water, my friend…..
Let’s Just Be Against Stuff, Shall We? If we don’t agree with the politics then we must be against the policies, mustn’t we? If the idea comes from the bosses, then the workers need to oppose it, don’t they? If the council propose cuts, then we should fight them, shouldn’t we? It will involve investing public money to further increase the gap between the rich and poor. It puts at unwarranted risk a vital organisation or service. It means committing to a course of action that cannot be escaped. The first of these will always get me into opposition mode! And sadly most of what we call ‘development’ in a modern city meets this criteria. The pursuit of GDP means finding ways to provide services, usually retail and entertainment, to people with disposable income, at a profit for investors. Usually this criterion is quite easy to apply. And as soon as a proponent of ‘stuff’ calls ‘trickle down’ into the debate than you can be pretty sure that your opposition is well founded. The second of these is harder to apply. It is more personal and subjective. After all what constitutes an ‘unwarranted risk’? And which services are ‘vital’? This is why I will get exercised over policies that impact on health, financial inclusion and education for example, but get less exercised, although sympathetic, about the shutting of libraries, the banning of hunting with dogs and closing swimming pools. There are other ways to access books, if access to books is the priority. There are other ways to exercise and socialise. And there are greater causes competing for my time than the modern day barbarity that is hunting. It is also why I can’t get overly exercised about communities building tree-houses, unless they are affordable housing! Unwarranted risk is trickier. Subjective. Personal. 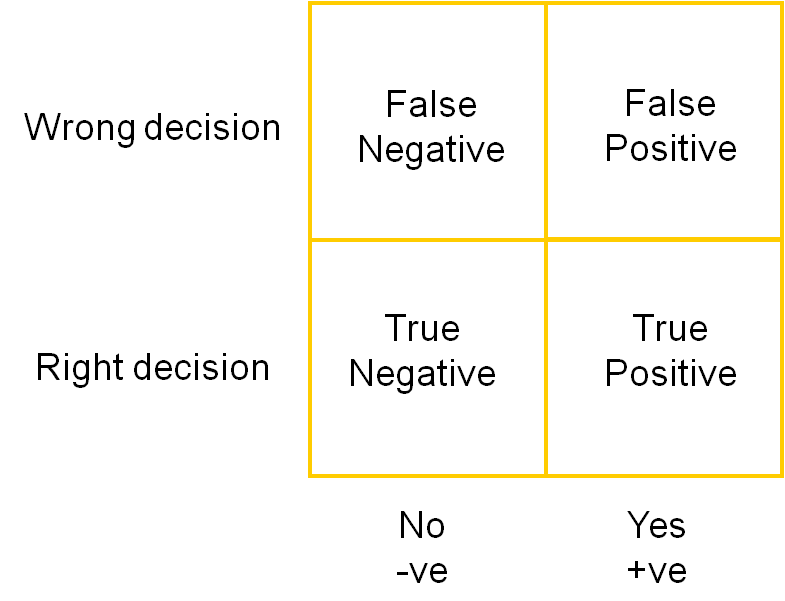 Here I do another thought experiment (if they worked for Einstein…..:-)) and try to assess the consequences of a ‘false positive’ compared with the consequences of a ‘false negative’. A ‘false negative’ is when we decide not to pursue a course and it later seems to be a wrong decision. So, if we decide not to build nuclear and we all end up dying in cold, dark caves, that would be a ‘false negative’. If, on the other hand, we go nuclear and end up frying in a radioactive hell – that would be a ‘false positive’. Now it strikes me that with coalition ‘healthcare reforms’ that Cameron and Clegg both reckoned that Lansley was about to press the button on a ‘false positive’ when a ‘false negative’ would be a much better option. Hence the listening exercise. Of course, ideally the world would be full of ‘true negatives’ and ‘true positives’: we would only ever make right decisions. It is sad that more politicians don’t feel like it might be electorally acceptable to say ‘we are just going to leave it be’ from time to time. And my 3rd criterion is that of generally, but not always, opposing a step that can’t be undone. Burning the boats may have worked for Cortez but as a rule of thumb it is not for me. Engineering a situation where people are compelled to push forward with a policy once it is enacted whatever the consequences rarely turns out well. So these are the guidelines that I use when deciding whether to be against stuff. Far from perfect, but they work well enough for me. However I try not to be against very, much at all. If my criteria leave room for doubt then I will ‘leave it be’. A ‘false negative’ is often better than a ‘false positive’ in my experience. Choosing not to object at all is better than deciding to object to something that you are not deeply committed about. I prefer instead to be ‘for stuff’ wherever I can. Especially stuff that will narrow the gaps between rich and poor in our society. But also stuff that will be fun, engaging, creative and challenging. And usually when I choose to be against stuff it is because it steals resources away from the things that I would like to see happen. I have been doing a bit of digging around looking at issues of pay differentials in and around Leeds. A top professional footballer in the UK can expect to earn in the region of £140 000 every week. It might take an average Leeds United player about 6 months to earn this much. A Teacher on an average salary in Leeds would take 4.5 years to earn £140k. A Registered Nurse would take nearly 6 years, as would a Police Constable. A Healthcare Assistant almost 9 years. A Teaching Assistant just over 10 years. A Qualified Playworker (L2) would need more than 15 years. The poor kids dad would take almost 30 years to get this income on current benefits. A young person on the Job Seekers Allowance would be an old person – at least 72 – before they accrued JSA payments worth £140k, if it were possible. All of these calculations should be treated with care. What Can We do About Child Poverty in Leeds? Since I posted my blog on Poor Kids in Leeds I have been asked again and again what can we do about it? Seems that people aren’t satisfied by the platitudes of writing to councillors and MPs or throwing a fiver at the usual charities – they want to do something. One of the things that we can do is get a group together, get more informed about what is already being done in the city, and come up with innovative ideas and suggestions for more things that we can do. So if you can offer a little time to help please leave a comment below. If you have any specific skills or knowledge that you can offer, or other resources that might be useful, like meeting rooms for example, then please do mention that too. Everyone can help with this. We are not necessarily looking for specialist knowledge and skills (lets face it ‘the professionals’ have hardly got this one covered), we are just looking for people that give a damn and can offer time and imagination. So please sign up using the comment form below if you want to have a bash at this. If you would rather not go public with your skills and other offers then just drop me an email. On October 14th we will be holding an Innovation Lab to explore how we might Disrupt Poverty in Leeds. You can find out more about this event here. NB Although I talk about Leeds I am sure that we will have very fuzzy boundaries and anyone from anywhere would be welcome to join us….